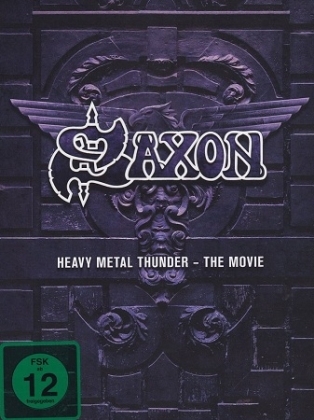 Just in time for Christmas, Saxon have released "Heavy Metal Thunder - The Movie" on DVD. FOr anyone who hasn't heard anything about the movie yet, it's a documentary charting the history of Saxon right from the very beginning up to almost the present day (obviously it has to end a year or so before the release to give them time to edit the footage together and get it released). Given the bad blood between Saxon's current lineup and the version fronted by former members Oliver & Dawson, it's very nice to see that both Oliver and Dawson have contributed fully to the making of the movie, so you really do get a very comprehensive picture of the history of the band - there's no attempt to gloss over any problems, they cover the good and the bad. I was very pleasantly surprised by this release - I wasn't expecting it to be anywhere near as interesting as it is. When I watched it, I really did find it fascinating - it's a really good look behind the scenes of a classic British band and in my opinion it's essential viewing for any Saxon fan. THe Movie is contained on one disc. The second disc includes a whole host of bonus features with the main one being the entire concert they performed on St Georges Day in 2008 at the Shepherds Bush Empire (which was a great gig to be at, and is great to watch). That makes it very good value - a full concert live show on top of the documentary and a bunch of other short films is great. For me the live concert alone makes this release worth buying. An excellent release that's well worth buying.